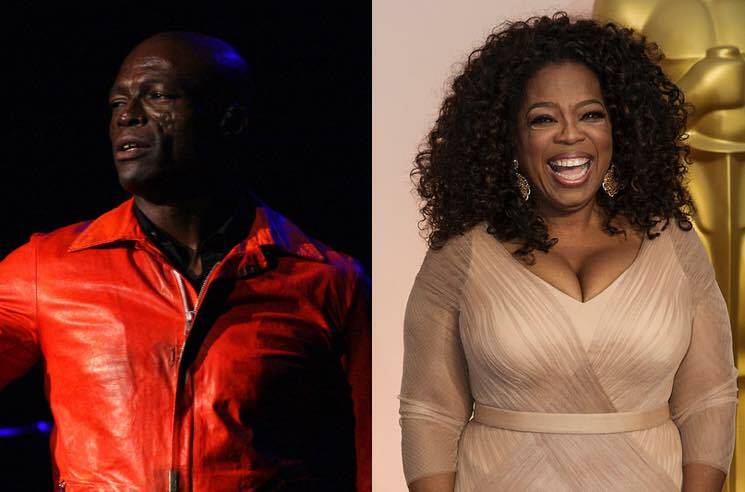 "What I re-posted was not an attack on Oprah at all"
As anyone probably could have predicted, going after Oprah on social media didn't end well for Seal. After sharing a meme featuring a photo of Oprah and disgraced movie mogul Harvey Weinstein, the singer has now issued an apology. Seal posted a video to Facebook, attempting to clarify his initial Instagram post. He started by saying that he has an enormous amount respect for Oprah and her achievements and contributions. "What I re-posted was not an attack on Oprah at all," he said. "She just happened to be the person photographed with the pig in the picture. No, what I re-posted was commentary on the hypocritical and double-standard nature and behaviour of Hollywood." He went on to share his support of the #MeToo movement, arguing that none of the women who have come forward so far have been served "any real justice" by the abusers simply losing their jobs over the allegations. Finally, Seal criticized Fox News for using him as a political pawn against Oprah, and told Stacey Dash to "keep my name out of your mouth" when it comes to promoting her "self-hating agenda."